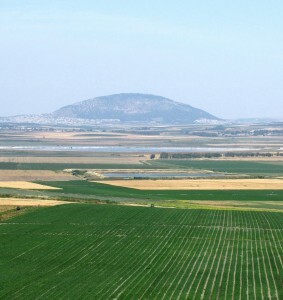 Stand at Armageddon (Revelations 16:16) overlooking the Valley of Jezreel (Hosea 1:4), and place of Ezekiel’s End of Days war of Gog and Magog. Here is the crossroads of the world where three intercontinental highways converge- from Europe, Asia, and Africa. This End of Days battle is also alluded to in the Gog and Magog war described in Ezekiel (38:3-23): “Thus said the Lord: Behold, I am against you, Gog, the prince… I will summon a sword against Gog on all my mountains… I will execute judgment on him with plague and bloodshed; I will pour down torrents of rain, hailstones and burning sulfur on him and on his troops and on the many nations with him. And so I will show my greatness and my holiness, and I will make myself known in the sight of many nations. Then they will know that I am the Lord.’. So why did this place – Armageddon – take on an association with an End of Days war? The answer lies in the geography of the area. Three intercontinental roads converge here in the valley, from Europe, Asia, and Africa. And for that reason all the great conquerors of antiquity have passed this way: Alexander the Great from the north (Greece), Nebuchadnezzer from the east (Babylon), and the pharaoh Thutmoses III from the south (Egypt). Another interesting point- it’s pretty much equal distance from this spot to the some of the world’s most strategic capital cities: Madrid, Paris, Moscow, Bombay, and Nairobi!!! Why is it also called Jezreel? The name Jezreel – Yizra’el in Hebrew- means “God will sow”. As the largest and most fertile valley of the country, it was in bible times the bread basket of the country. The significance of the name, and nature of the area as prime farm land, raises the biblical question, “who” will sow the seed and provide grain, the staff of life: The God of love and justice that that lives within us, or the pagan stone gods? Indeed, on nearby Mount Carmel, Elijah called the people to decide who is the true provider- Yahweh or Ba’al (Canaanite equivalent of Zeus or Jupiter). In the Bible God warns the people that if they follow the pagan gods he will bring drought upon the land, there will be no rain, and then of course no wheat, as it is a rain dependent crop, not an irrigated one. Jezreel is also the name of the prophet Hosea’s son from the harlot Gomer whom he married (Hosea 1:3-4). God asked Hosea (8th century BC) to marry a harlot in order to demonstrate what real devotion and love is. Such was the love and devotion of Yahweh to his people, in spite of their behavior as harlots, chasing the skirts of the pagan gods. For more info on visiting the Jezreel Valley and Armageddon- place of the End of Days battle of Gog and Magog, please contact Zack Shavin in Israel, veteran guide and biblical archaeologist at Land of Israel Tours. This entry was posted in Galilee and tagged Armageddon, End of Days, Ezekiel, Gog and Magog, Gomer, Hosea, Jezreel, Magog, Megiddo, Revelations by zshavin. Bookmark the permalink.